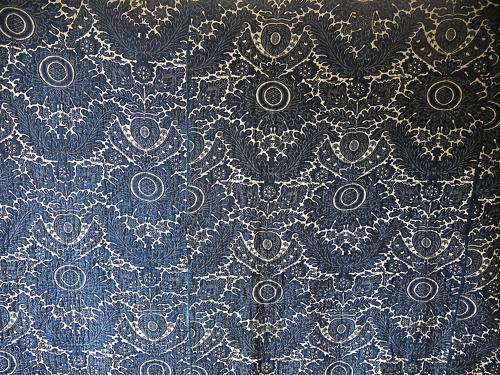 Late 18th century circa 1780s French indigo resist quilt blockprinted on a coarsely woven cotton clotn.Stylised design with ardhing acanthus leaves.backed in a c1800s block printed design of flowered baskets.Wonderful rare piece. Quilt has one stain approx 70cm from the bottom and 50cm in from the edge. Some minor holes and a fewpatched repairs.